The Semacon S-1100-C currency counter offers a complete solution for counting and validating the new Canadian hundred-dollar polymer note. The S-1100-C has been specifically designed to accommodate both old and new currency without having to separate before counting. Data Financial, Inc. has announced the availability of a currency counter which offers a complete solution for counting and validating the new Canadian hundred-dollar polymer note. 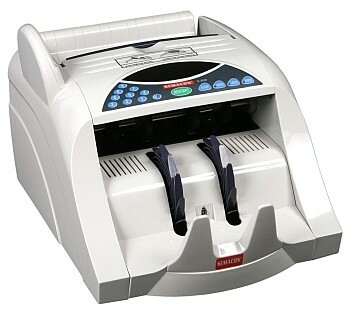 The S-1100-C has been specifically designed to accommodate both old and new currency without having to separate before counting. John Malaczynski , Manager of eCommerce operations at Data Financial, Inc. is introducing the Semacon S-1100-C Currency Counter to financial and retail users throughout Canada. “I am excited to introduce this product,” Malaczynski said, “it is fully compatible with old and new style Canadian currency and is designed to anticipate the additional currency changes to the fifty dollar bill in March of 2012.” The S-1100-C will also accommodate the releases of the twenty, ten, and five dollar bills projected for late 2013. “Meeting current and future needs makes this machine an affordable and exceptional solution,” according to Malaczynski. According to reports, the Canadian Finance Minister had announced the introduction of the new polymer bank note in response to counterfeit activity and the desire to modernize Canadian currency. As of 2004, approximately 470 counterfeit notes per million were detected in circulation throughout Canada. The new bills are more secure and they are also more cost effective as they are predicted to be in use for 25 or more years. In the last twenty years, since polymer bills were created, countries such as Australia, Bermuda, Brunei, New Zealand, Papua New Guinea, Romania, and Vietnam have move to this technology. Since 2010, it is reported that as many as seven countries have fully converted to polymer notes. For the US market, Data Financial, Inc. continues to offer traditional currency counting and sorting products for all applications. Single note counters, currency scales and currency sorters are available for all financial and retail cash counting operations. The company also offers high speed, multi-pocket currency sorters for high volume cash environments in financial institutions and casinos. Since 1983, the company has focused on cash processing, check handling, and employer technology solutions for business, banking, retail and gaming environments. This focus has enabled us to be the best at what we do, nimble and relentless in finding solutions for our customers, offering diversity in product and service. The company is Gold Certified Microsoft Partner offering custom solutions for cash processing, time management and gaming technology throughout the US. Visit Data Financial, Inc. at http://www.datafinancial.com.